Homeopathic remedy provides relief for: Motion sickness, fear of travel including cars, boats, trains, and airplanes/flying. Vomiting, drooling, panting, restlessness and unwanted behavior can be helped with this fast acting, non-sedating liquid. 15ml. Ingredients: Cocculus, Passiflora, Valeriana, Borax, Colchicum Autumnale 6c & 30c in 20 USP alc. in purified water. Over 100 lbs - 20 drops per dose. Start dosing one hour before trip. A full dose may be given every 15 minutes up to 4 doses if needed. Dosing may be repeated throughout the trip if needed. If pet is crated, remedy may be dropped around bedding area also. For pets under 1 lb, 2 drops in water and follow dosing instructions above. Remedy may be dosed directly into mouth, in water, or on food/treat. 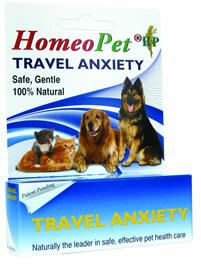 Remedy only needs to be used if pet is exhibiting symptoms of anxiety or motion sickness.